Last year, it was reported that Scottish local authorities receive a call about a pothole every 3 minutes – which equates to more than 400 complaints about the unsightly holes being logged every day, up by a third. Many were filled, but potholes are continuing to appear on our streets on an almost daily basis. If you have driven in Scotland, the chances are you have hit a pothole on your travels and that deafening clunk, when we realise it’s too late to avoid it, will be very familiar. In fact, one in four of you claim you hit at least one pothole every day! A pothole is defined as a crater in the road that measures at least 40mm (or 40cm) deep. An AA survey in 2016 found that its members in Scotland were the worst affected by potholes, followed by those in Yorkshire and Humberside. In 2017 it was reported that Scotland’s potholes were “four miles deep”! 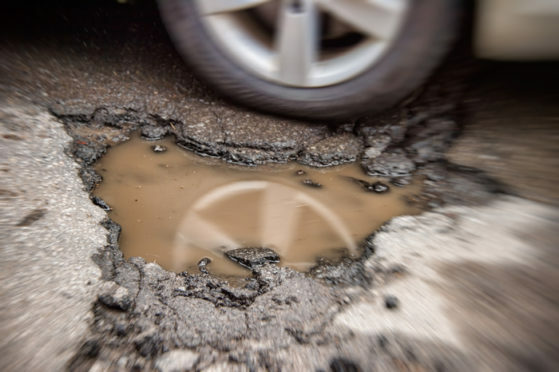 Did you know that in just 12 months, the country’s pothole damage bill soared by a fifth to £68million in just 12 months? That’s according to a 2017 study by Kwik Fit. On average, car damage caused by potholes costs more than £100 to fix. *You can report a pothole in your area on a local road or ‘B’ road at www.mygov.scot/report-pothole/ (as your local authority is responsible for maintaining local roads and footways). If the pothole is on a trunk road, like a motorway or ‘A’ road, then call Traffic Scotland on 0800 028 1414. “Are you a pot hole victim? Perhaps your steering is pulling to one side, your tyres are wearing unevenly or your handling is acting strange? Don’t leave anything to chance, your vehicle may be dangerous and you should get it checked immediately. Settle your mind by calling Anderson Clark Motor Repairs, Inverness on 01463 222324. Our digital alignment system will check and identify any problem areas before it’s too late. Anderson Clark Motor Repairs are established as the premier independent motor vehicle servicing and repair centre in the Highlands. Under E.U legislation new vehicle owners can have routine servicing carried at our premises at 16 Carsegate Road, Inverness without invalidating the manufacturer’s warranty. The key reasons for our success is the high level of customer service, satisfaction and high levels of repeat business coupled with access to the latest technical data and diagnostic equipment. To find out more about Anderson Clark Motor Repairs, visit their website here. SPONSORED: Are you ready for the busiest MOT month?